Carefully retrieve your Christmas decorations from the attic. Remove your kitten from the bag of baubles. Remove your kitten from the tree. Untangle the fairy lights and lay them in lines along the floor. Plug in the fairy lights. Watch your kitten’s eyes light up as she places her little mouth around one of the lit bulbs. Switch off the fairy lights and spend 10 minutes untangling your kitten from the string of bulbs. Start to wrap the lights around the tree. Enlist the support of a small boy to entertain your kitten. Finish decorating the tree with the fairy lights. Upon hearing a small boy’s squeal, turn round to see your kitten scampering off with a long piece of tinsel in her mouth. 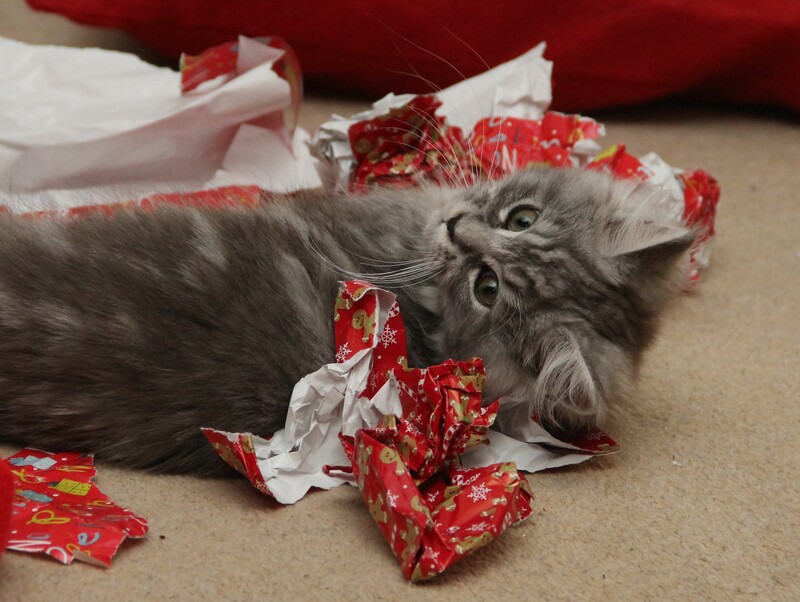 Retrieve the tinsel from your kitten and decide that you don’t need tinsel this year anyway. Grab the bag of baubles. Start to hang the baubles on the branches of the tree. Observe your kitten boxing the baubles on the lower branches. 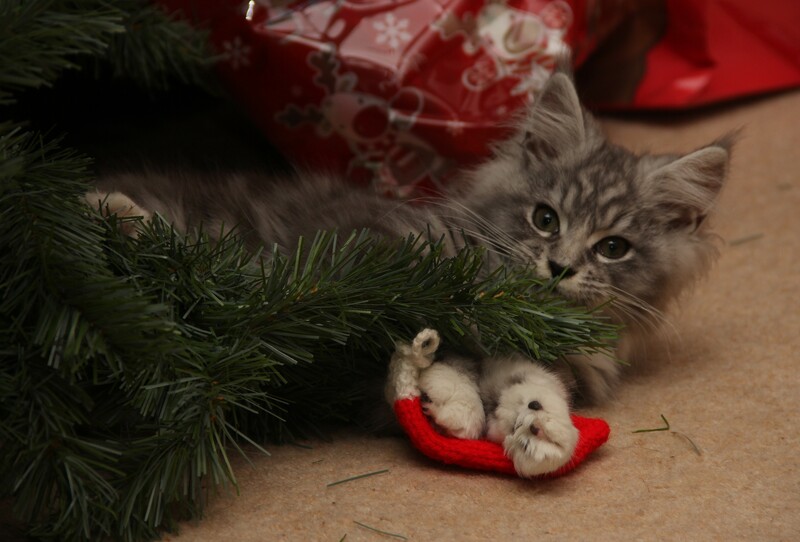 Raise the baubles to higher branches, leaving your kitten a small knitted stocking to throw about. Stand back and admire your tinsel-free, half-decorated Christmas tree. Grab some Christmas paper to finish wrapping those last minute gifts. Roll out the paper on the floor. Remove your kitten from the paper. Using a large pair of scissors, cut the paper, avoiding your kitten’s chunky little paws as they swipe at the blades. Observe all the crumples and scratch marks in the paper. 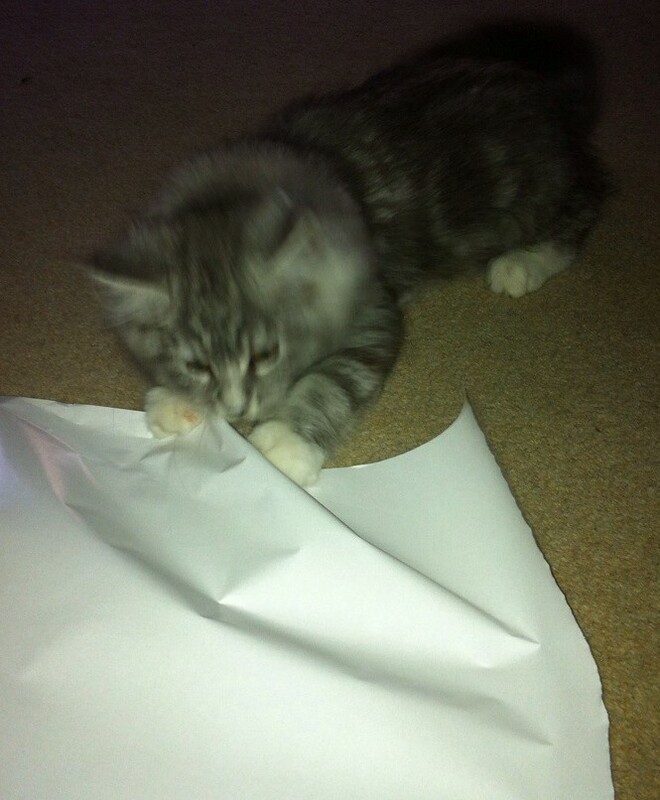 Screw up the paper, throw it across the room and watch with a chuckle as your kitten scampers off to play with it. Roll out some more paper. 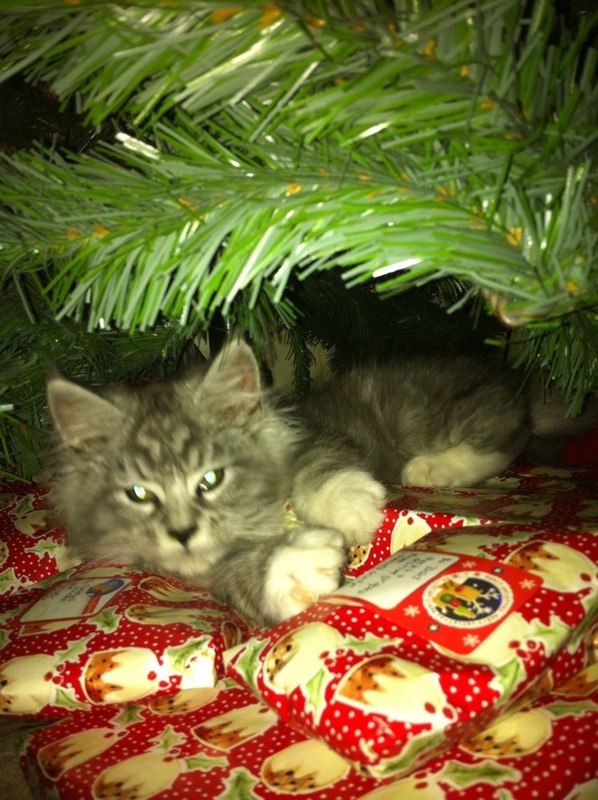 Watch as your kamikaze kitten appears from nowhere and lands in the middle of the wrapping paper. Cut another piece of paper and hastily wrap the present, taping up all the claw marks and holes in the paper. Well, the present needed some ventilation holes anyway. 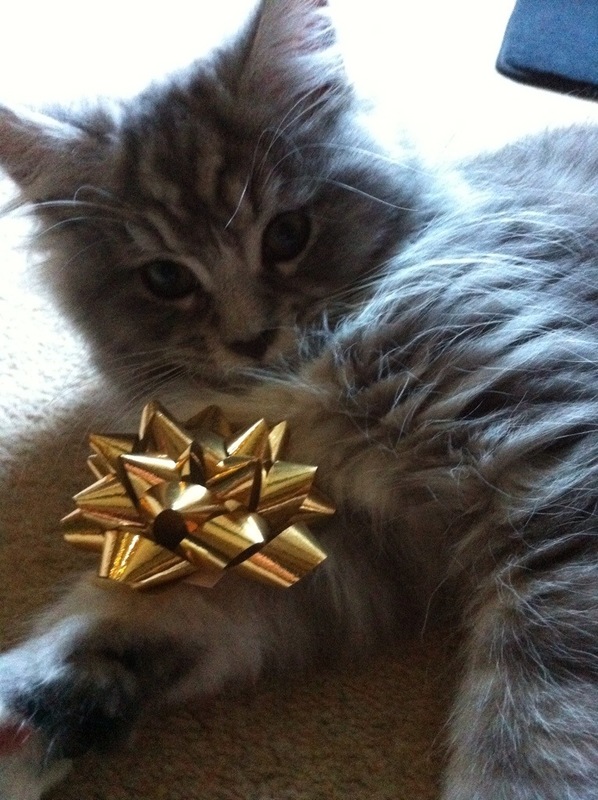 Go and fetch some shiny ribbon to wrap round the present and so detract from the teeth marks and claw holes. Cut a length of ribbon. Chase after your kitten and retrieve the ribbon. Tie the ribbon quickly round the present. 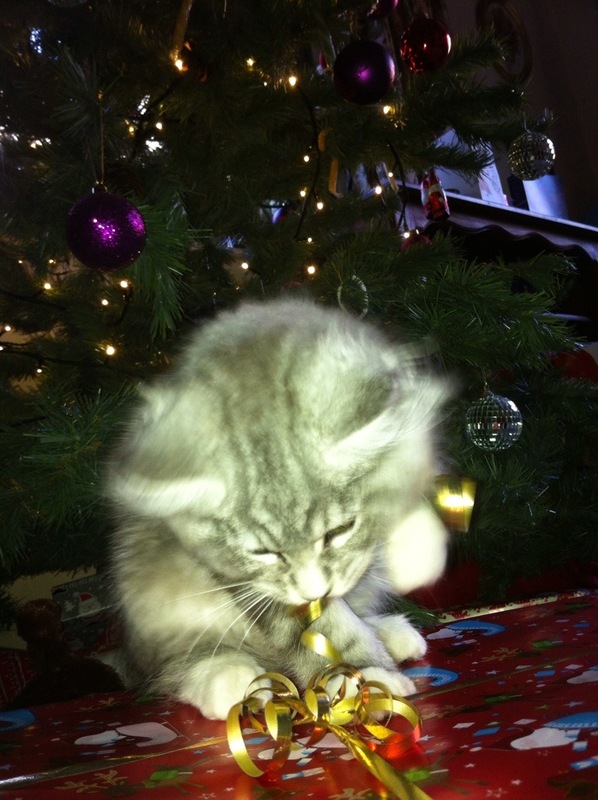 Note how your kitten’s teeth make a great tool for curling the ribbon. Remove your kitten from the present. Grab a packet of shiny foil bows. Pick a bow to stick on the present. Watch your kitten pick a bow too, and observe her running off with it in her mouth. Note how your kitten comes back and picks another bow from the packet. Laugh as she shimmies clumsily round the lounge with the bow. Frown when your kitten comes back to pick yet another bow. Hide the packet of bows. Distract your kitten and place the present out of reach. Tip out some small gifts from a bag and place them on the wrapping paper. Chase after your kitten as she runs off with one of the gifts in her mouth. Retrieve the gift and count the teeth marks in it. Look up to see your kitten gleefully charging about the room with another gift in her mouth. Watch as she jumps down behind the sofa and secretes the gift in her HQ for Mischief and Mayhem. Try to move the sofa, without success. Watch as your kitten emerges from her HQ, sits on the arm of the sofa and smiles at you. Shake your head and laugh. Maybe you’d bought too many presents anyway. Remove your kitten from the Christmas tree. Give up on the present wrapping and make your way to the tub of Roses chocolates. Lick your lips, then curse when you see how many chocolates have been eaten already. Go and find your boys and berate them for being so greedy. Head back into the lounge in time to discover your kitten with her head in the Roses tub. 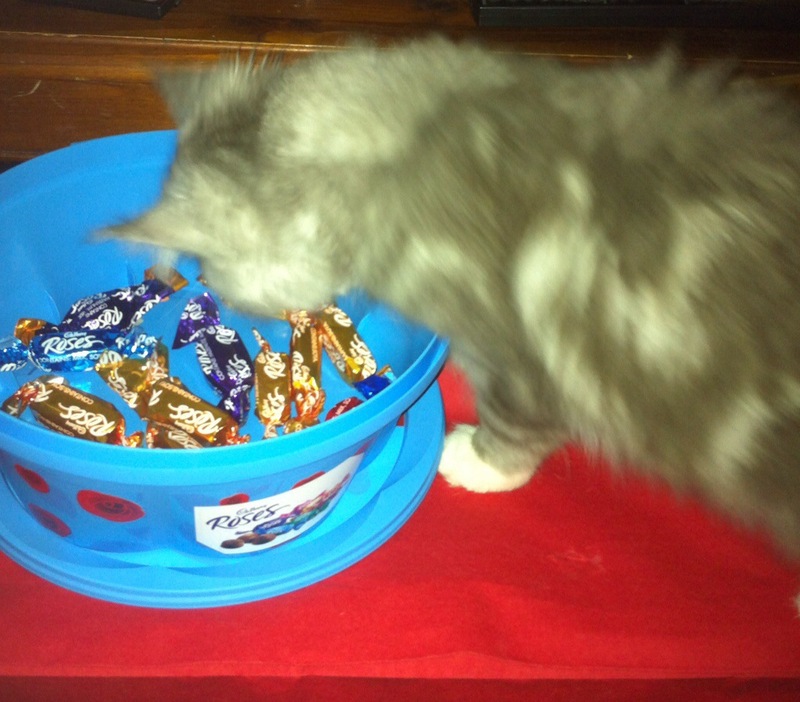 Watch as your kitten skedaddles with a wrapped chocolate between her teeth. Follow your kitten to the dining room, where you discover her not-so-secret horde of stolen chocolates underneath the table. Ask your kitten why there are ‘pine needles’ across the floor, when you have an artificial tree. Watch your kitten look at you with a big question mark over her head, as she runs her teeth along the branch of the tree and spits out the greenery. Find the Christmas sherry, and take a good, long swig – you’ve earned it. Sit down in your chair and sigh. Watch as your kitten takes a flying leap and lands on your leg. Wince with pain as your kitten practices her mountaineering skills by digging her claws in your flesh as she climbs up you. Smile as your kitten reaches your face and headbutts you affectionately. 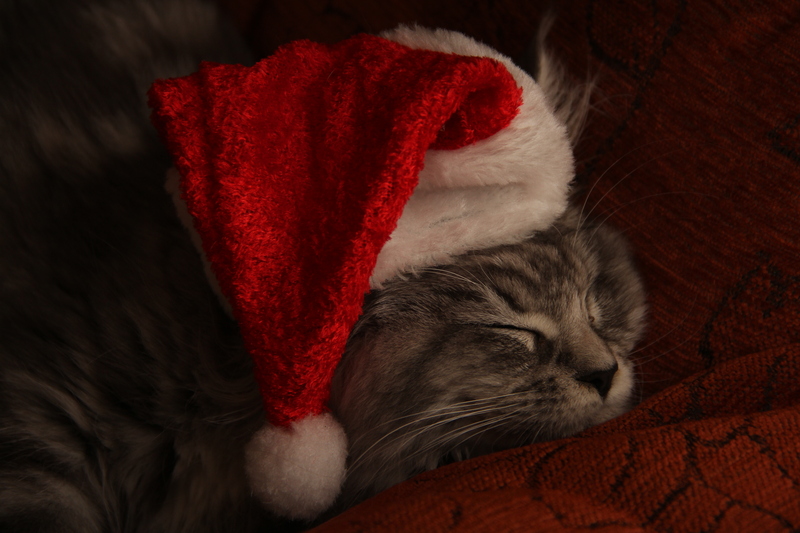 Feel the vibration of your kitten’s purr as she settles down and dozes off in your arms. 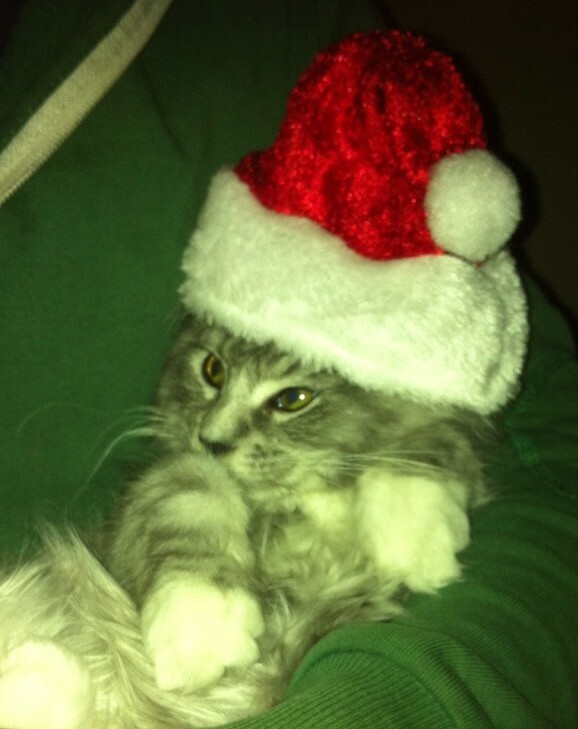 Reach across and grab a little Santa hat to plonk on your kitten’s head. Survey the mess around you, plant a kiss on your kitten’s head and whisper contentedly, “Happy 1st Christmas, Gloria Chufflepuff”. Oh, I so enjoyed that Jen. Would have loved to watch nd laugh with you. Happy new cat iwning. Thanks, Evelyn 🙂 She’s certainly keeping us on our toes… and we’re loving every single minute of it!